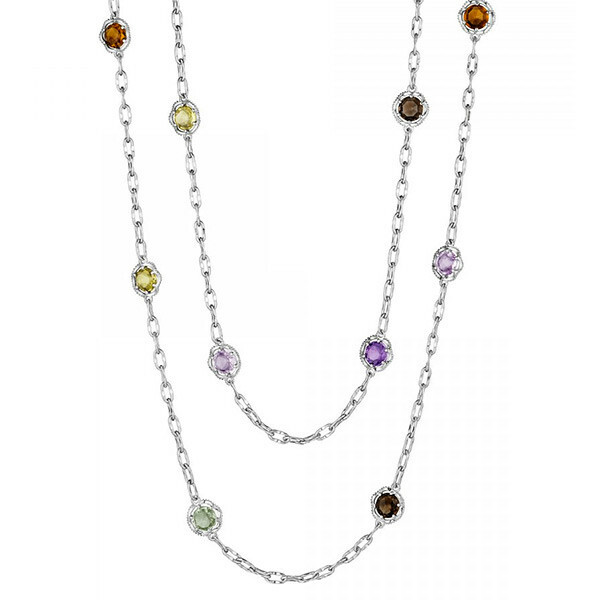 Color Medley Sterling Silver Mixed Gemstone Station Necklace 38"
A Tacori classic, this station necklace is featured in the 18K925 Color Medley collection. It features citrine quartz, smoky quartz, amethyst, rose amethyst, olive quartz, prasiolite, cognac quartz and lemon quartz to create a casually elegant and lovely look. The vibrant and colorful design has a sophisticated and luxurious look with a very modern edge, perfect for today's woman. Truly iconic glamour!